Should you choose the Instant Pot Duo Plus or the Instant Pot Smart WiFi? Instant Pot is the most recognized pressure cooker brand. From the original Instant Pot to the latest versions with smart features, these appliances allow you to cook, steam, roast, and much more. There are many versions of this appliance, including the Instant Pot Duo Plus and the Instant Pot Smart WIFI. If you plan to buy a pressure cooker appliance, you should definitely look into and compare these two models. 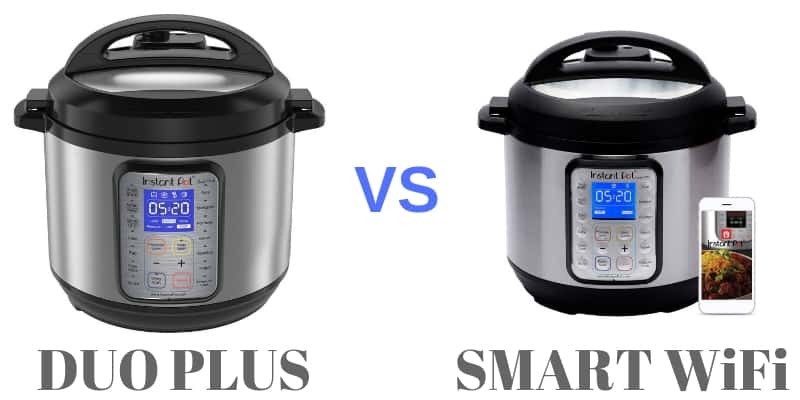 Instant Pot Duo Plus vs Smart WiFi Models – What’s the Difference? With the Duo Plus and the Smart WiFi versions of the Instant Pot, you get a compact pressure cooker that features a variety of cooking functions. However, there are a few significant differences between the two. The Instant Pot DUO Plus was released after the original and popular DUO model and introduced two new cooking functions. With the DUO Plus, you can cook eggs and sterilize bottles and utensils in addition to the other regular cooking modes compared to the original IP DUO model. The Smart WIFI model does not have these extra operating modes. However, it does allow you to add programmable cooking scripts. These scripts let you set the duration and temperature, allowing you to recreate the modes used for sterilizing bottles and cooking eggs. The Instant Pot Smart WIFI includes 13 built-in programs and provides access to over 750 pre-programmed recipes. The Instant Pot Duo Plus includes 15 smart programs but does not allow you to add custom scripts. The custom cooking recipes used on the Smart WIFI model are added via the mobile app, which is available on iOS and Android devices. After connecting the Instant Pot to your local WIFI network, you can control the appliance through the mobile app. Besides adding custom cooking programs, you can use the mobile app to change the settings, turn the appliance on or off, and check the progress of the current operating mode. This also provides complete control over the temperature. The Instant Pot Smart WIFI is one of the few Instant Pots that allows you to cook at any temperature. You can instantly change the temperature using the mobile app or set any temperature using a programmable script. There is one more difference to discuss. The Instant Pot Duo Plus is available in three different sizes. You can get a three, six, or eight-quart version. The Smart WIFI is only available in a six-quart size. The sizes, programmable recipes, mobile app, and temperature control are the primary differences between the two models. They both feature an updated LCD display. The display is larger compared to earlier models, making it easier to check the cooking time. They also both have large buttons for the built-in programs. Both Instant Pots also include the same 10 safety mechanisms. They have a steam release, safety lid lock, lid position detection, automatic temperature control, and other safety features. However, the Instant Pot Smart WIFI also includes an additional self-diagnostic function to detect errors within the appliance. The original Instant Pot Duo is the best-selling Instant Pot. With the Duo Plus, you get everything included in the original Duo as well as two new additional functions. With the Instant Pot Duo, you can cook, slow cook, steam, cook rice, sauté, warm food, and make yogurt. The Instant Pot Duo Plus also added the ability to sterilize, cook eggs, and bake cakes. It is a 9-in-1 multi cooker. Besides the extra cooking modes, the Instant Pot Duo Plus features an updated LCD display. The display is larger and easier to read than previous models. There are also four new status icons, including an icon to let you know when the Instant Pot is heating or cooking. In out opinion, the DUO Plus is the best value for money option among all the models in the product series. The Smart WIFI version offers 13 different pre-programmed cooking functions, including most of the standard cooking modes found on the Instant Pot Duo Plus. While it does not have the sterilize function, there are instructions for sterilizing glass jars, baby bottles, and utensils. When Instant Pot first released the Smart Instant Pot, it included a Bluetooth connection. This required users to be within range to detect the Bluetooth device on their smartphones. Due to connectivity issues, Instant Pot replaced the Bluetooth connectivity with WIFI. You can now connect the appliance to your local WIFI network and control it via the mobile app. The only drawback is that you cannot choose a different size. The six-quart size is your only option. Conclusion – Which Instant Pot Is Right for You? The Instant Pot Duo Plus and Smart WIFI are both great appliances that provide a variety of functions. They are easy to use multi cookers for preparing healthy dishes and for quick and effortless meal preparation. About the price tag of the two models here, the Smart WiFi option is slightly more expensive than the DUO plus. When comparing these two products side-by-side, there are two main features that stand out on the Instant Pot Smart WIFI. With this model, you can add or create programmable recipe scripts and control the appliance via the mobile app. Some users may find the mobile app and scripts too complicated. If you are satisfied with the standard cooking functions offered on the Instant Pot Duo Plus, there are no major reasons to consider buying the Smart WIFI model. However, some people like the idea of having remote control over their Instant Pot. If you enjoy technology and smart appliances, you may prefer the WIFI Instant Pot. Besides the technology features, the Smart WIFI model also allows you to cook at any temperature. You can adjust the temperature using the mobile app or with a programmable script. This offers users more control over the appliance and this feature is not available on the Instant Pot Duo Plus. Keep in mind that the Smart WIFI only comes in a six-quart size. If you want a three- or eight-quart Instant Pot, you may need to get the Duo Plus or one of the other IP models such as the ULTRA, DUO, LUX etc. In the end, either option allows you to prepare a wide variety of dishes. The Instant Pot Smart WIFI is for more tech advanced people. However, some people may find the variety of options to be more than they need. We suggest to get the DUO Plus since it’s a more solid appliance in our opinion.